Today is DLD Awareness day. I’m sure there will be people reading this who don’t know what DLD is, and that’s why we need an awareness day! It stands for Developmental Language Disorder, and it is when children have a specific difficulty with language processing, which affects their understanding of what is said to them and/or their ability to express themselves. This is not a new difficulty, and it’s actually quite common (affecting around 2 children in every class). However, it is a hidden disorder and generally people don’t know about it. We need to change that, as it’s really important that the problem is known about so that children can get the help they need! You can find out more about what DLD is in this video and this video. 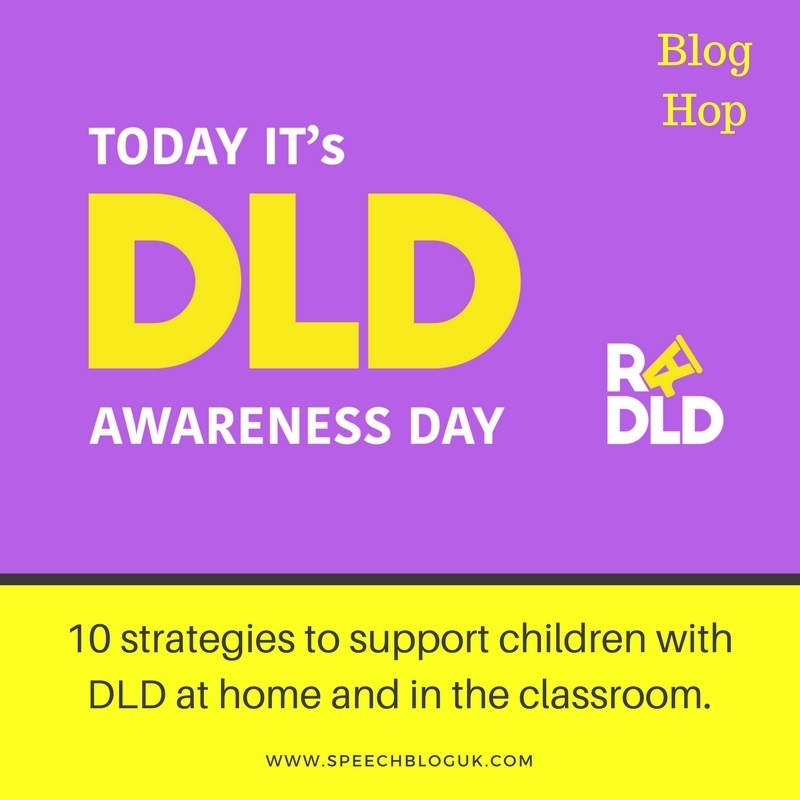 One thing that hasn’t helped with raising awareness is that until recently, lots of different names were used for DLD – language disorder, Specific Language Impairment and others. Now it has been agreed that DLD is the correct term to use. You can find out more about why the change in terminology happened here and here. 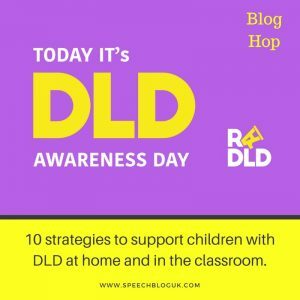 For DLD Awareness Day we have joined up with some other SLT bloggers in the UK to write a series of posts (and one podcast!) about DLD, what it is and how you can help. You can find links to the other posts in the series at the end of this post. Get the child’s attention. If listening and understanding are hard work, it’s easy to switch off. Get the child’s attention by getting down to their level (or trying to get eye contact), saying their name and getting them to look. In the classroom, the child may need more breaks from listening than the others as it is tiring and difficult for them. Reduce your language. Use short, simple sentences whenever you can. Say things in the order they need to be done. For example, instead of saying “before you put your book in the tray, put your pencil away” say “put your pencil away. Then put your book in the tray”. Slow your rate of speech down a bit to give them a chance to process. Show them. Often, visual support such as pictures, signs and demonstration can be really helpful for children with language difficulties. These will usually help other children too, not just those with DLD. Use as many senses as possible to teach a new concept. Look at it. Touch it if possible. Draw it. Show the child what to do. Summarise. After you have given your classroom input or instructions to the class, summarise what you have said. Use short, simple sentences and simple words as far as possible. If there are several things that the children need to do, tell the children how many things there are to remember and count them off on your fingers, using simple words. If you can do this more than once, even better! You can do the same thing at home if you are giving a list of instructions. Link words. Children with DLD often don’t make links between words easily. Link new or harder words to simpler ones. Talk about all the aspects of a word – what does it sound like, what other words are similar in meaning, can you draw it or act it? There is so much you can do around vocabulary. For example, if you are teaching the word “orbit”, draw it or use your fingers to show what happens. Check out Anna’s post, or look at Word Aware which is a great whole class or whole school approach to vocabulary teaching. Comment rather than question. It is natural to us in conversation to ask a lot of questions. 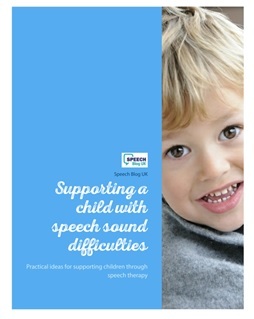 For some children with language difficulties though, this can become difficult and pressurising. Question words in particular are difficult to understand and are confusing. Try to comment on what they are doing rather than asking a question. Offer choices. Sometimes it can be hard for children with DLD to remember words. Rather than “what do you want to eat?” try “would you like apple or banana?”. For very young children, show them the objects on offer as well to start with. You can do a similar thing with answering more complicated questions. For example, if “what did you see at the castle?” is too hard try “did we see armour or swimsuits?” Start by offering obvious choices to give them confidence but you can gradually try offering more similar options. Add a word. If your child says a short phrase or sentence, say it back to them and add a word. For example, if your child says “doggy eating” you could say “yes, doggy’s eating dinner”. If your child says “the dog is eating dinner” you could say “yes, the dog is eating dinner hungrily”. Recast. If a sentence comes out in a muddle and there are grammatical errors, don’t tell them they said it wrong. Instead, say it back for the child to hear with the errors corrected. This is called recasting. For example, if your child says “I goed shopping”, you could say “that’s right, you went shopping”. Check understanding. Check that the child has understood what they have been asked to do, or the concept they have been taught. For some children, asking them to say back what they have to do in their own words will be helpful. For others, this is too hard. Getting the child (or the whole class) to repeat the important bits can be really useful. I saw one teacher who would ask the whole class to say something back several times. For example, “we need to write the date. What do we need to write?…. Tell the person next to you, what do we need to write?…. Shout it as loud as you can, what do we need to write?… whisper it….” You get the idea! For more ideas and strategies, check out our free handouts. Please read the other posts in our DLD Awareness Day blog hop too. Catherine from Wise Old Owl Speech has a brand new podcast on the change of terminology for you to listen to here. 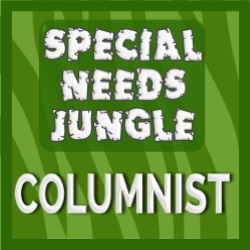 Lucy Sanctuary has written about DLD and ASC here. Jude Philip has written a post entitled DLD and the older student – unravelling the knot here. Anna from Word Steps SLT has written about helping children learn new vocabulary here. Finally, please spread the word about DLD today, either by sharing this post or by sharing RADLD’s video DLD 123. My 4 year old twin grandchildren are struggling with phonics. Although I feel they are a little young to be doing this. But the system requires them to be able to do it. 2 of my 3 daughters struggled too. They learned and remembered words. They both have good jobs and are avid readers,so the way they learned was ok for them. I think that my grandchildren may have a difficulty with DLD so any information would help. The school is going to statement them to get help with their speech. My daughter is quite upset about this although she understands why.